Hello everybody! It’s been a hot minute since I did one of these posts, but today it’s time for another instalment of Disney Recommendations, this time for an assortment Pixar characters. Onto the post! Hello everybody! Today, since we are now well into spring (despite the deceptive weather), I’m going to be doing the Spring Flowers Book Tag. Onto the post! The Upside of Unrequited is about a girl experiencing love for the first time after many years of unrequited love. I don’t talk about it anywhere near as much as I do Simon Vs but I really love it as well. I can’t think of any! No point trying to lie. This was unexpectedly hard to come up with! I think the aforementioned Simon Vs the Homo Sapiens Agenda would fit? Ways to Live Forever has the saddest ending ever. Ooh I don’t know. I remember feeling embarrassed when I read Bras and Broomsticks because of the title, which everyone commented on. Nick’s at the end of Geek Girl melts me every time. There are loads. The most recent one I can think of where I was laughing a LOT is A Girl Called Shameless! The Boy at the Back of the Class is about a child trying to befriend the Syrian refugee who has just joined their class, and it’s thought provoking, moving and somehow incredibly funny all at once. Beautiful Broken Things focuses almost solely on a female friendship! It’s great, and the friendships are super complex. What are your thoughts on the books I’ve mentioned? Do you have a favourite flower? I’d love to hear in the comments! Hello everybody! Today, it’s time for my monthly reviews post for March, and I had a pretty excellent reading month. Onto the post! Hello everybody! 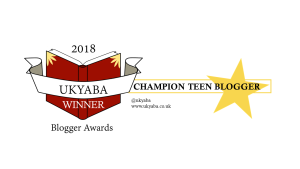 Today, I’m really excited to be part of the Children’s Book Awards– an award that can be voted for by anyone under 18- blog tour, with an interview with Lisa Thompson, whose book the Light Jar is on this year’s shortlist. Onto the post! Hello everybody! Today, I’m going to be talking about my most anticipated releases for next month. Onto the post! Today, I’m going to be doing the Twenty Questions book tag, which I found on Paper Fury. Onto the post! Hello everybody! Today, I’m taking part in Top Ten Tuesday and I’m going to be telling you about some books I hope/plan to read during Spring. Now, if you know me you know I’m not the best with TBRs and I think one reason for that is that I don’t tend to put review copies on them, so this time I’ve listed my current review pile which I will almost certainly read and then a few I’d like to read from other sources e.g. I bought them or have them on loan from library. Onto the post!